A few snow showers from last night lingered early this morning, then the afternoon was mostly cloudy with highs that reached the mid-20s. This air mass producing temperatures around normal for this time of year will continue for our area over the next few days. Calm weather will continue this evening, then snow will move in from the south in the early-morning hours. A Winter Storm Warning has been issued for Northern Michigan. For Ogemaw, Iosco and Arenac counties, the Winter Storm Warning begins at 4 a.m. Tuesday. 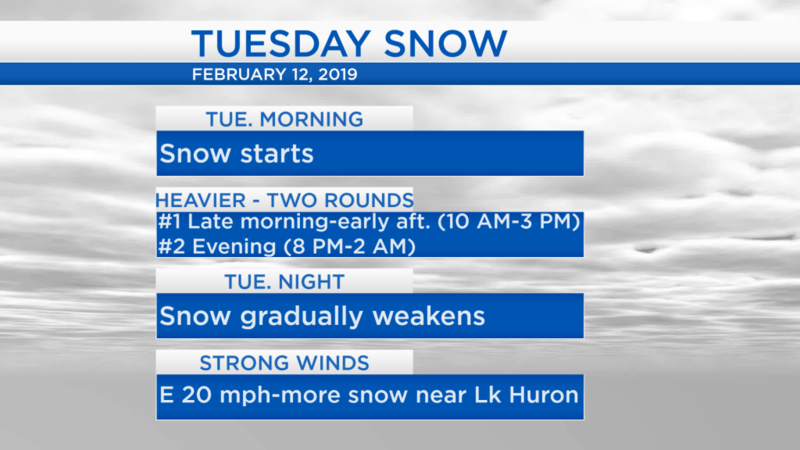 In Alcona and Oscoda counties, the warning begins at 7 a.m. Tuesday morning. Farther north, in Alpena, Montmorency and Presque Isle counties, the warning starts at 9 a.m. Tuesday morning. For all areas, the warning ends Wednesday morning at 9 a.m. The storm system is currently over Northern Oklahoma and will track through southern Michigan tomorrow. Plenty of snow on the northern side of this storm will move through our area. 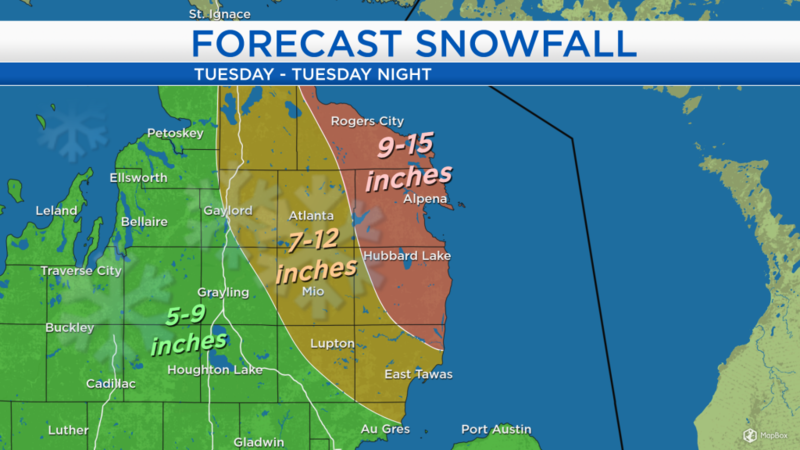 Also, the track of the storm will bring strong winds out of the east for Northern Michigan. Snow will start tomorrow morning, and become increasingly heavy. Two rounds of heavier snow are expected, the first round moving through in the late-morning to early-afternoon, then lighter snow for a while in the late-afternoon, followed by a second round of heavier snow during the evening. Light snow will continue Tuesday night, gradually weakening. 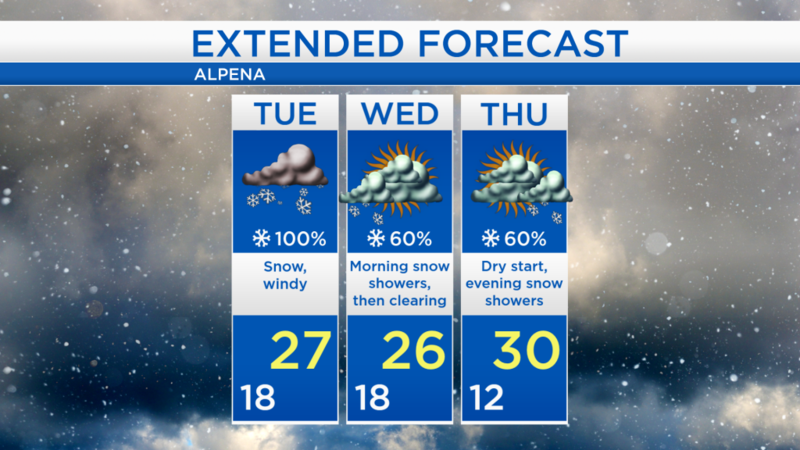 Strong winds out of the east play a role in forecast snow amounts. 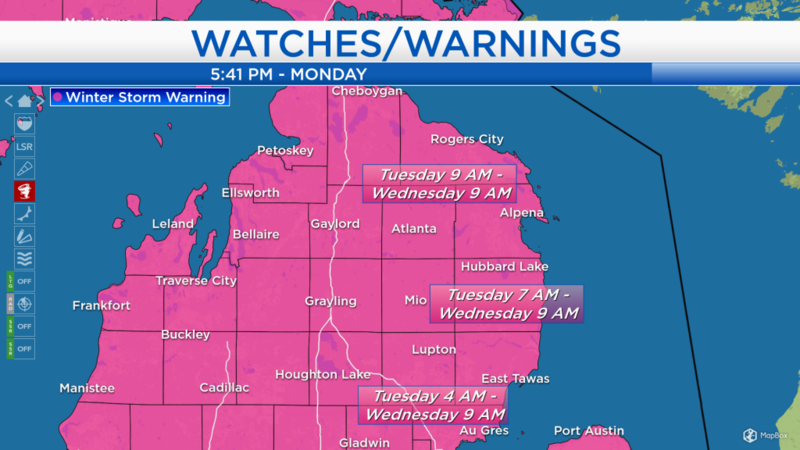 Winds traveling over Lake Huron will enhance snowfall amounts for areas near the Lake, 9-15 inches are forecast for the areas shaded in pink — most of Alpena, Alcona, and Presque Isle counties (9-12 inches will be common, with isolated spots getting 12-15 inches). West of that, for the areas shaded in orange, 7-12 inches of snow are forecast, including Montmorency, Oscoda, and Iosco counties. Snow and wind will be the main issues tomorrow, and high temperatures will reach the upper 20s. A few snow showers will last into Wednesday morning, then clearing into the afternoon. Dry weather will continue for Thursday morning and afternoon as highs reach about 30 degrees. Cooler temperatures are expected for the end of the week. For the rest of Northeast Michigan’s weather forecast, watch the latest weather video by clicking the weather tab at the top of the page.